Since its founding in 1914 — and particularly from the 1970s onward — the development of JWU’s Providence Campus has helped rejuvenate the state’s business hub, created jobs, added to the city’s revenues and enriched the local culture. Between 1970 and 2000, JWU enrollment increased by more than 1,000%, bringing thousands of students from across the globe to live and study in the city. The Providence Campus is the largest of the university’s 4 campuses in land, facilities and enrollment. With more than 10,000 students from all over the world, it is also the largest of Rhode Island’s private universities. During the post-WWII years when Johnson & Wales was growing from a business school to a college, downtown Providence was Rhode Island’s cosmopolitan hub of culture, art and commerce. High-end department stores like The Outlet Co. occupied an entire city block on Weybosset Street. But between 1945 and 1985, the city’s population declined by 40%. The growth of suburban shopping malls in the 1960s saw an exodus of trade. The Outlet closed in 1982, and in 1986 a fire gutted the once-grand enterprise. The resulting debris and toxic contaminants were an impediment to reuse and development of the site. When former JWU President John Yena '06 Hon. assumed his role in 1989, JWU was housed in scattered downtown buildings. When renowned urban architect Andrés Duany presented a vision for a Downcity rebirth and a broadened sense of community, Yena saw JWU at its center. In conjunction with several government agencies, JWU funded site cleanup, then purchased the land from the city. Duany drew plans for JWU’s growth. In the early 1900s, Fields Point — the area that is now the Harborside Campus — was a pristine public park and beach resort. During World War II, it was closed off and filled in to house the Providence Shipyard. The land was later converted into various industrial businesses and then a dump site. This history inspired JWU to revitalize approximately 100 acres of the waterfront area providing a range of environmental and recreational benefits to the surrounding communities, and a stunning natural setting for the campus. Major facilities on the campus include the Alan Shawn Feinstein Graduate School, the Harborside Recreation Center (home of the NCAA Division III Wildcats), Harborside Village residence halls that house more than 500 students, and the university’s Culinary Arts Museum that contains more than 500,000 culinary artifacts. 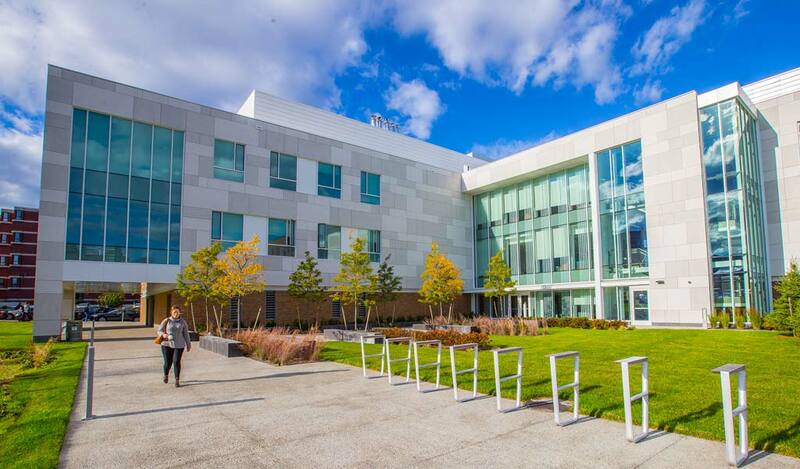 The campus’ newest focal point, the Cuisinart Center for Culinary Excellence, opened in spring 2010, and is designed to become the nation’s first Leadership in Energy and Environmental Design (LEED) certified culinary lab facility. The 82,000-square-foot building houses 30 state-of-the-art teaching labs and classrooms, helping the College of Culinary Arts achieve higher levels of food safety and sustainable food practices in response to the growing national concerns over health and nutrition. JWU’s partnership with Save the Bay — a nationally recognized and award-winning environmental organization — complements these green efforts. JWU provided a six-acre waterfront parcel for Save the Bay’s headquarters, an environmentally “smart design” building where students, residents and visitors are educated about the fragile bay ecosystem. The project has been recognized by the Environmental Protection Agency (EPA) and GreenSource magazine as one of the nation’s top brownfields redevelopment projects. In 2011, the Grace Welcome Center became the third environmentally sustainable building on the campus. Also designed to achieve LEED certification, this new admissions facility is another contributor to the university’s ongoing reclamation and revitalization of Providence’s industrialized waterfront. Additional work on the Harborside Campus includes a reconstruction of the harbor shoreline, a public walking trail, athletic fields and other open green space.